The bones of six humans—including two children—jade beads, shells, and stone tools are among the Maya "treasures" recently found in a water-filled cave off a sinkhole at the famous archaeological site of Chichén Itzá in Mexico, archaeologists say. The ancient objects are most likely related to a ritual human sacrifice during a time when water levels were lower, sometime between A.D. 850 and 1250, the researchers say. It's "very improbable" that the remains and artifacts were "just tossed" into the sinkhole, known as a cenote, expedition leader Guillermo Anda told National Geographic News in an email. Rather, he said, they were likely placed there during a ceremony to appease the Maya rain god, Chaak. Extending from what is now southern Mexico through Guatemala and into northern Belize, the Maya Empire is noted for having the only known written language in Mesoamerica, as well as for its elaborate works of art and architecture. Chichén Itzá was one of the greatest Maya cities on Mexico's Yucatán Peninsula. The discovery of a human sacrifice deep in one the region's cenotes supports the idea that, for the Maya, the sinkholes "represented thresholds of communication with the spiritual and sacred world that lay under the surface of the Earth," said Anda, a professor at the Autonomous University of Yucatán. 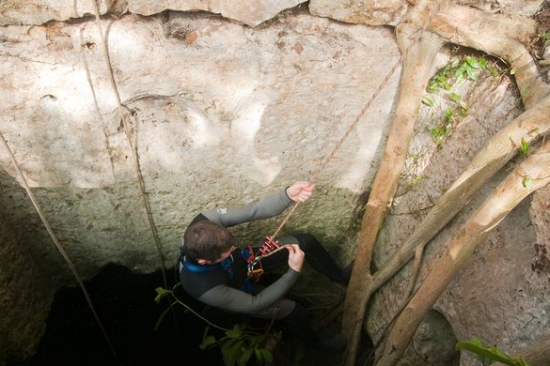 A member of Anda's team descends into the Holtun cenote, where the evidence for ritual human sacrifice was discovered during the 2009-10 field season. The sinkhole is near El Castillo, a step pyramid at the heart of Chichén Itzá that was dedicated to Kukulkan, a feathered serpent deity. At the time of the newfound likely sacrifice to Chaak, the region was in the throes of a long-lasting drought, according to Anda. "We believe this prolonged drought might have been an important factor in the so-called collapse" of the Maya civilization, he said. The Maya Empire went into a mysterious and precipitous decline around A.D. 900. Another member from Anda's team descends into the Holtun cenote during the expedition, part of the Cenote Cult archaeological project associated with Mexico's National Institute of Anthropology and History. 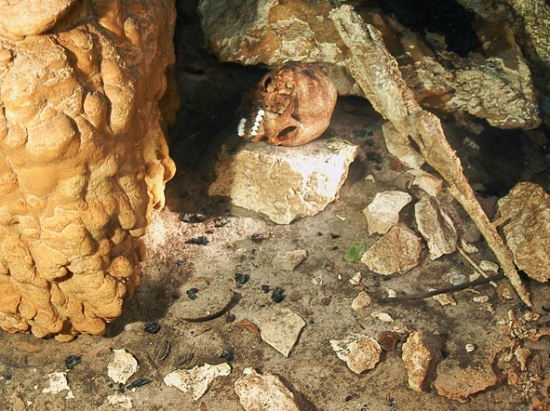 For the project, Anda and his team systematically explored and surveyed 33 caves and cenotes at Maya sites across the Yucatán Peninsula "where we expected to find representations of ritual activities," he said. 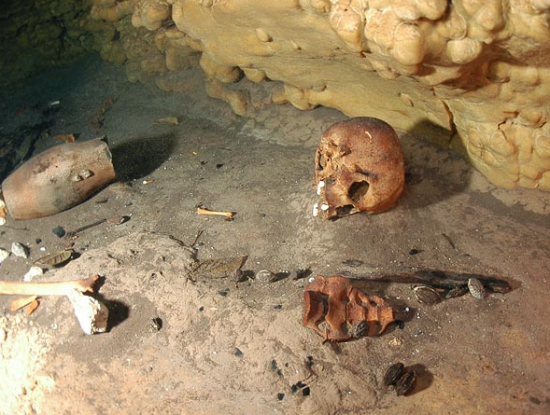 The archaeologists found the remains of at least six humans—including this skull—on the ledge in the Holtun cenote. The remains and other artifacts were found about 70 feet (21 meters) into a horizontal passageway into the wall of the cenote. The only way for the objects to have gotten there, the archaeologists argue, is for humans to have placed them deliberately—during times of drought, water levels were likely low enough that the passageway would have been dry. To have arrived here naturally, Anda said, the artifacts would have had to fall in the water at a time when the passageway was submerged, as it is today, "stop their trajectory toward the bottom at around ten feet [three meters], then swim horizontally toward the ledge where they are deposited today."